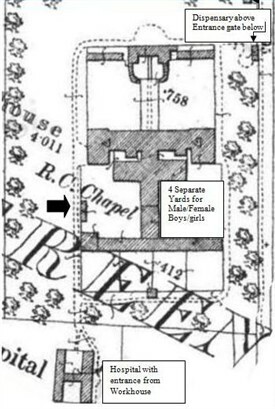 Plan of Ballinrobe Workhouse showing Hospital to the rear of site. Detail from OSI Historic 25" to 1" Map. Memorial to hundreds who died at Workhouse and are buried at this location. At centre the only cut-stone building of the workhouse. This was the administration building which would have been at the front of the complex. 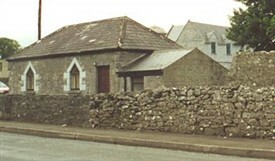 The cut-stone Dispensary building which was a later addition to the Workhouse complex. The Irish Government did not become involved in poor-relief schemes before the introduction of the ‘Poor Law’, unless there was a serious crisis. It had been left to the local authorities such as the Grand Juries in the counties, and the corporations in the cities and boroughs, to assist the poor. In 1838 the 'Act for the Effectual Relief of the Destitute Poor in Ireland' was passed. The country was to be divided into 130 administrative units known as Unions, which were an amalgamation of adjacent parishes, to form one administrative unit. Each Union was to have a Workhouse run by a Board of Guardians, which comprised of elected Guardians and local Justices of the Peace. The Workhouses were to be financed from the Poor Rate. Ballinrobe Poor Law Union was formed 16th November 1839. The new workhouse, built in 1840-42, occupied a 6-acre site on Kilmaine Road to the south-east of the town. It was designed to hold 800 inmates and its construction cost £7,000 plus £1,400 for fixtures and fittings etc. It was declared fit for the admission of paupers on 24th March 1842, and admitted its first inmates two months later on 26th May 1842. Ballinrobe’s Workhouse was probably designed by Wilkinson, and built in what was accepted as ‘Domestic Gothic’ style. They were handsome additions (externally) to the town; however the interior was another matter. 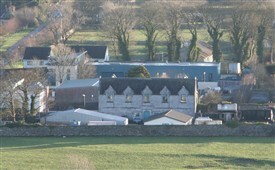 Ballinrobe workhouse consisted of three main parts. The entrance or front building was situated about 150 yards from the main block. It housed a Board room and clerk's office on the top floor, with a waiting room and porter's room on the ground floor. Also located within this building were the probationary, vagrant and refractory wards. At its rear were the privies and fumigation areas. Behind this was a narrow garden (with the boys' and girls' yards on either side, separated by a wall) which led to the main block as can be seen from a similar layout. This building was two storeys plus attic level, with dormers with a long façade, and had double gabled three storey blocks at either end. The central rooms contained the apartments of the Master and Matron (managers of the house). On the ground floor, to the left, was the girls' school with the boys' school on the right. The three-storey block at either end contained the wards for the old and infirm. The children's dormitory was situated over the schoolrooms. Some distance behind this was the main building of the workhouse, with a spine extension at the back at right angles, which contained the utility rooms. Together these formed "the body of the house". The infirmary building completed the basic H plan of the main part of the workhouse, although it was not possible to pass from the body of the house to the Infirmary without going outside. Around the buildings was a complex of exercise yards each surrounded by a high wall. The Workhouse was supplied in 1891 with fresh water through a pipe from the Bulkaun River and in 1893 there is a reference in the Ballinrobe Chronicle to a horse pulling around the pole of the capstan pump in the Workhouse. In 1898 a report of damage to this pump’s shaft by the horse was noted. A horse, whether it was the same one or not, was sold for £6.10.0 in 1902. Sir F. B Head on his tour of Ireland c 1852 inspecting R.I.C offices also visited the “ enormous” workhouse in Ballinrobe ( no doubt containing amongst others the evicted people from Lord Lucan’s estates) where he states there had been 4,400 inmates in 1,850 reducing to 1,670 in 1852. He goes on to describe the process of evictions and the men employed “to take off the roofs in the neighbourhood of Ballinrobe as levellers. Kickham give a graphic description in his novel of the sadness of the break-up of families; the mother, father and children all separated and some only hearing of the deaths of their families at Mass on Sundays. The inmates could not go to their segregated dormitories till 8 p.m. and were forbidden by the rules to play cards or other games. Most slept in rows on straw, when available, on a slightly raised platform, tilted towards the center of the room which had a passage for traffic. There was no water and at the end of the passage, where a large container for relieving oneself, which often overflowed, was located. Naturally this left a terrible stench and contributed to the spread of disease. These primitive conditions, with little covering apart from a thin blanket, and later a few rags were dim and squalid and resembled prison interiors. People lost their sense of dignity, and outsiders considered their pauper state a crime, so these tragic people ended up serving time for being poor. Females were required to wear a striped jerkin, a petticoat of ‘linsey-woolsey’ and another of stout cotton, a cap, a shift, shoes and stockings. Children were not given shoes as it was considered unnecessary as they were not used to wearing them. Men wore a coat and trousers of barragon, (wool cloth) cap, shirt, brogues and socks. Inmates were considered Government property so when the bell rang at 7 a.m. and when dressed, they assembled at the central dining hall for prayers and roll call. They collected their rations and sat in silence to eat it and would have been punished if this rule was broken. Afterwards they faced their long day on the various chores, perhaps breaking stones which applied to both men and women, grinding corn, working on the land attached to the workhouse or at any other manual work. “No individual capable of exertion must ever be permitted to be idle in a workhouse and to allow none who are capable of employment to be idle at any time.” The women also washed and mended clothes, attended the sick and the children also. Children when not at rudimentary school were not exempt from work. While there may have been slight regional differences, generally the diet for adults consisted of two meals per day: Breakfast: Eight ounces of stir-about and half a pint of milk and Dinner: Three and a half pounds of potatoes and one pint of skimmed milk. Poorer Irish people seldom tasted bread or meat. Children received three meals consisting of 3 ozs of oatmeal and half pint of fresh milk for breakfast, 2 ozs of potatoes and another half pint of milk at lunch and 6 ozs of bread for supper. We know that there was a hospital and fever sheds at the Workhouse where many people died. In 1894 there were 5 cases of Typhus. Both residents of the Town and surroundings were also brought to the hospital here as was the case of Kate, daughter of John Curran of Cloongowla after receiving burns from an oil lamp. It states in the Ballinrobe Chronicle April 6, 1867 The Guardians of the Workhouse passed a resolution authorizing the doctor "to issue tobacco to such inmates as the doctor may consider to be in want of same, as being necessary to their health such being done in other unions (workhouses) in Ireland." In 1869 the doctor, much to the objection of the guardians, prescribed for a young boy with fever some whiskey, wine and 2 lbs. of meat to aid his recovery. In 1922, during the Irish Civil War, most of the Workhouse structure was burned. Fought from June 1922 to May 1923 between two opposition groups of Irish Nationalists; one supporting the Provisional Government’s side, establishing in Dec. 1922 the Free State, the other the Republicans who felt the Treaty represented a betrayal of the Irish Republic. Finally, some small factory units were erected around 1993 on the derelict part of the site. The original buildings that survived are now used as a local county council depot with new offices being recently c 2009, constructed beside the entrance to the site. Traces of the workhouse graveyard can still be found at the back of the original site. It is said that some of the dead were buried in unmarked, shallow graves, located just outside the boundary on the southwest of the ruins. 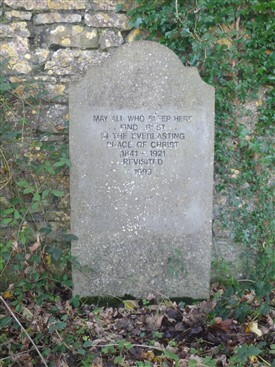 One small plain headstone marks the old graveyard, where it is suspected hundreds are buried. A cut-stone headstone marks this plot. The real irony is that, on approaches to Ballinrobe, two massive Water Towers can be seen on the skyline. If one compared these Towers to two large trees, their roots would be growing from this graveyard area; the Towers could be considered Ballinrobe’s monument to this sad and bitter history. To find this site just follow the entrance to Ballinrobe’s Twin Towers. No. 3 on the Town Heritage Walk. O’Connor, J., The Workhouses of Ireland – The fate of Ireland’s poor, Anvil Books, Dublin 199. Hamrock Ivor, (Ed) The Famine in Mayo 1845-1850, Mayo County Council, 1998. I enjoyed visiting the existing remains of Ballinrobe workhouse last week. My forebear, Bridget McDonough (Biddy - daughter of Mary and Michael) was one of the few of the Earl Grey Orphan immigrants to Australia on the ship, the Panama in 1850. She emigrated at the age of 16 and would have endured a life of hard, hot work as a drover's wife in north western New South Wales. She bore 8 or 9 children. One of her sons is recorded as drowning in the Bulloo River, most likely while driving cattle overland. One of her daughters and grand daughters became licenced publicans (this may have been unusual for a woman in its day) in the furtherest settlement of western Queensland (Cunnamulla) at the turn of the century. Bridget (Biddy) died in Cunnamulla at the age of 81 (approx 1915). My beloved late father was born in this pub in 1937. He was the sixth son of Lucy Kerrigan and a fine, self reliant man. No doubt Biddy had a life of challenges - common occurance of that era but no doubt an interesting life. To go from the lush green cold Mayo county to the hot dry interior of Australia - I can only imagine a part of her heart always remained in Mayo county. I believe her father Michael hailed from Connemara. I regret not finding that out earlier as it was only a stones throw from where I stayed at Ashford Castle last week. Editor: Delighted to hear from you and with such an interesting story too. Do you have any photographs of your grandmother or where she lived in Australia that you would like to share? My husband has an ancestor, Patrick Joseph Bohen (also known as Patrick King) born in Ballinrobe about 1848. If he was born in the workhouse or lived there for any period of time, would he be in any of the records? His father was also called Patrick Bohen. I don't know why he used the surname King whilst in the Army, but wondered if this was his mother's surname? Any light anyone can shed on this mystery would be very welcome. Editor's reply: First of all, thank you Jane for your interest in Ballinrobe's Heritage & History. I have been trying to find a source and list of clients of the workhouse for years but only came across a handful of names here and there. Your query is so interesting I am going to investigate further over the next couple of weeks and see if any light can be thrown on your queries. I will get back to you if I get any clues. In the meantime perhaps others might have suggestions on sources of workhouse name lists and also name-changes etc, which would be very welcome. Have you any idea on what Regiment he joined? A relative of mine was a wards-maid in the Galway workhouse in 1911. She had been widowed for many years and later died in St Bride's, in Loughrea, Co Galway. Would she have been an inmate at the workhouse in 1911 as she is listed in the 1911 census there, so presumably spent the night there? Or would she have lived in the town and just worked there as a paid employee? Some of the employees of the workhouses were given accommodation and food as a supplement to their wages. At that time widow's were often left without property, so may have been satisfied to have accommodation available to them. Also by 1911 some of the workhouses were being used for retired workers who had nobody to look after them (all their families having emigrated). Hope this is of some help to you as we do not have the Galway records available to us. Unfortunately we do not have the Co. Galway records. My great x3 grandfather, Edward Hearne, was the clerk of the Board of Guardians who died from fever in 1847 during the height of the famine. Would he have lived at the Workhouse like the other staff? The people that had rooms at the workhouse were the Master, Matron, Teachers and Porter. The Clerk probably lived independently.